4th & King Station is the terminal for Caltrain in San Francisco. 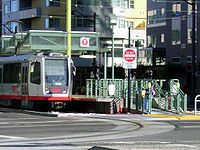 Caltrain passengers can transfer to Muni to downtown and other parts of San Francisco. All Caltrain local/limited stop and Baby Bullet trains begin or end at this station. Caltrain ticket machines and Clipper card readers are located in the station concourse. All riders must have a valid ticket or tagged Clipper Card before boarding Caltrain and train crews may inspect for fares at the station (after Giants games and other special events) or onboard. Riders using Clipper should "tag off" after exiting the train. For riders with Clipper cards, Clipper Add Value machines are located in the station concourse. The nearest Clipper vendor is the Walgreens located across the street from the station. This station has 11 tracks stretching from Townsend to King Street. Each door has a sign showing the departure time of the train on the platform. Passengers wait in the concourse until boarding begins 10-15 minutes before departure time. The door to the platform will close promptly at departure time. There are two Muni Metro platforms located outside the Caltrain station. Judah trains stop at the platform on the King Street median (closer to the Caltrain station) and Third Street trains stop at the platform in the middle of 4th Street south of King Street (see photo). Pay fare on the vehicle with cash or Clipper card when boarding. Riders heading to Downtown SF can board either the T or the N train. 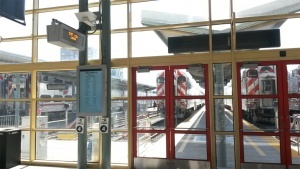 An overhead electronic sign located by the Caltrain station (on King Street) shows the real-time departure information for both lines so that riders can decide which platform to go. E-Embarcadero historic streetcar line provides service to the Ferry Building and Fisherman's Wharf from this station. Board the E line cars from the low level platform next to the N line platform on King Street at 4th Street. Buses stop at various locations on 4th Street and Townsend Street. Bike Hub operates a bike station (located on Townsend Street side the station). It provides staffed bike parking and bike servicing at the station Monday through Fridays. This station also has 180 bike lockers, call Caltrain at 650-508-6350 to sign up. This page was last edited on 16 November 2018, at 13:45.